ANDRIY.CO - Data Collection Terminal based on Google Android. ActiveX DLL. Data Exchange Programming. We briefly describe step by step how the goods written into the data collection terminal. from the accounting system, we must write to the file InventoryListToTCD.xml. When the data collection terminal accessed through Web-service to the application BarCode Terminal Hosting for the goods list, Barcode Terminal Hosting will return the contents of InventoryListToTCD.xml into the data collection terminal. Once we made the stocktaking and entered actual inventory rests into the data collection terminal, our task - to transmit the data to the accounting system. We describe the process of uploading data from the terminal in steps. data collection terminal accesses Barcode Terminal Hosting and send information about the actual inventory rests through the Web-service. 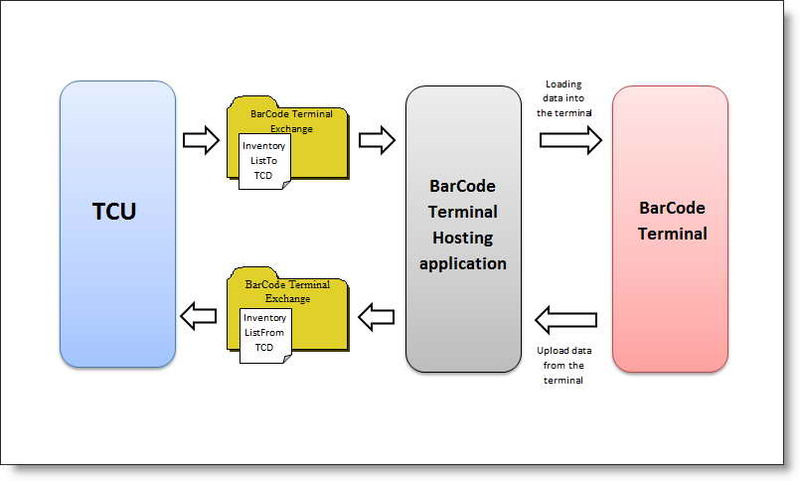 Barcode Terminal Hosting writes inventory rests data into the file InventoryFromTCD.xml. Once the system has been developed exchange, but to put it demands absolute universality and the possibility of interfacing with any accounting system, the question of simplifying the programmers who will match records system BarCode Terminal Hosting. The simplest and correct solution - to create OLE-components, ActiveX library that implements the data exchange with the methods of reading and record. This library is called BarCodeHosting.dll and comes together with the application BarCode Terminal Hosting. During installation, the application library located in the Windows\System32 folder and is automatically registered. Describe classes, properties and methods that implement this Library. Writer- a class that implements a data record in the file InventoryToTCD.xml from your system. Public Sub WriteData () - writes a list of commodities in file InventoryListToTCD.xml. For re-entry is required reopen the facility to record and add a method OpenWriter Product list. Subclass Recordset lets you directly access the data for more advanced programming. Example of using class Writer (from the sample application). Reader- a class that implements the data read from the file InventoryFromTCD.xml the accounting system. Example of use. In this example, we read data from file InventoryFromTCD.xml and add them to the cycle in the object lstDataFromTerminal (Class ListView), to view the form. It must be noted that the Reader and Writer classes are wrappers around ADODB.Recordset class to simplify the programming, because specific and limited tasks. Library BarCodeHosting.dll can be downloaded in source code with Training example. It is free to explore and modifications to discretion of the developers of systems interfaces. The library was deliberately implemented in Visual Basic 6, as this development environment currently provides the most simple implementation of the ActiveX DLL, which is very promotes the study and understanding.